Payload - one person - second person or a couple of children and picnic things are OK too. A swift rowing boat for one person - with the capability of carrying an extra person (or two if they are not toooo heavy) for fishing or picnics. Easy construction - but an easily driven shape that is rewarding to row. This design has had a very long gestation – over two years. My normal well-documented plans were around half way finished and I just couldn't continue – a sure sign there was something I wasn't quite happy with. I scrapped the whole thing and started again a few weeks ago. 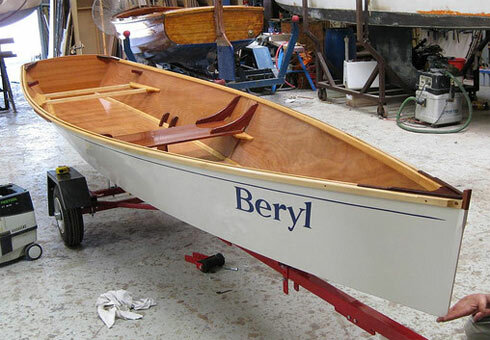 Generally I don't design boats to order but in this case two emails from old boatbuilding friends prompted the development of this boat. Initially I headed in the direction of something much more racey, but then realised that Peter and Richard wanted speed but with more flexibility. The racey version was finally rejected when Peter asked me about where he was going to cut the bait! For some time I've thought of using the Goat Island Skiff (GIS) design as the basis for a rowboat – more slender, lighter, lower. 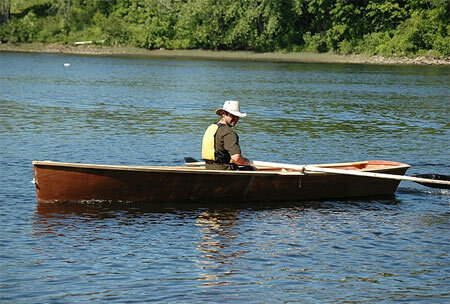 It also is a response to the number of lightweight plywood dory designs that are around these days. Old dories weighed hundreds of pounds and were around 20ft long overall and are reputed to need a good load of fish to make them into stable platforms – shrink them and lighten them and the stability drops off very rapidly. Of the modern, shorter, lightweight dorys, the better ones of the modern kind paddle very easily but are tender until you have a load aboard and their speed is limited by the short waterline. The worse ones are so twitchy as to be almost useless. Some try to fudge a dory shape by having curved clinker sides. But then you lose the simplicity. This rowboat is not really suited to wavey oceans, but will be fine in estuaries are rivers where there is a chop. On thinking about the rowing boat brief.... no, dash it all NO passengers, if she wants to come we'll go in Gruff (ie the Goat Island Skiff) or the canoe! Sooo... two sheets of ply long, needs to be a bit more utilitarian than a shell, so that one can cast a line or pick up a crab pot, but really it's a boat for the sheer pleasure of going for a row. I don't know too much about rowing properly, but a sliding seat option may be ok?? Has to be pretty, which is why I'm keen for you to look at it! The Goat Island Skiff with a foot out of the beam?? Was to say, yes, yes, yes – but Richard had slightly different criteria as far as payload. For efficient rowing on the river (Murray) - so against current, some chop, wake from power boats, but not open ocean or rough water. Come to think of it, the wake thrown up by your average yahoo driven ski boat probably qualifies for 'rough water', especially as I'll often have my little daughter in the 'boss's seat'. Will be used for fishing (I sit when I fish in a boat) and exploring. Cheap to build without sacrificing usability. Light - although this boat will be carried on a trailer, it will be launched and recovered from river banks, not boat ramps. Light enough to car top or for one person to carry would be nice but not essential. I'm after a tough, light, utility boat, not an ultra-light weapon. Enough floatation for safety if swamped - I'm not some panic merchant who expects it to float on its water line when full of water - just high enough to get back into. Again – Yes. A move toward general use as Richard describes willl also make the plans more interesting to more people. She will float a little deep with three aboard but by keeping the base of the transom narrow and shallow any bad effects will be minimal. I think she will prefer to carry three lighter individuals or a heavier adult a lighter adult and a child – though she will be at her best one up. The front and back seats take up a lot of the boat length for a safety factor but also to push the passengers toward the middle of the boat. The middle seat is very wide so there can be two sets of rowlock sockets – front one for when there is a passenger in the back. It can be used for storage or batteries if using a electric trolling outboard. 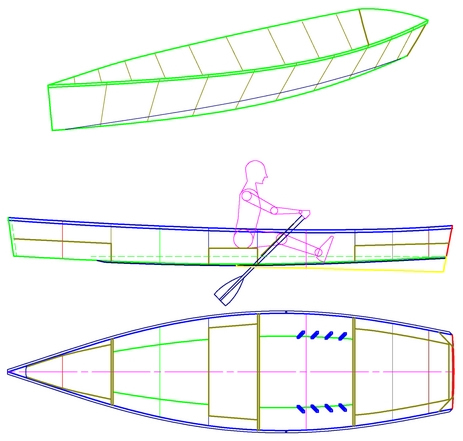 I drew up shape on the computer and emailed some panel outlines so models could be made by both interested parties – they are both experienced boatbuilders. The photos of the rowboat model arrived the next morning! Peter whipped it up overnight and photographed it with the red timber glowing in the morning light. The white boat is the model of the Goat Island Skiff that Peter built years ago. Scale is approximately similar. The version that has been developed since has more side panel flare to give a larger beam for more stability and to carry 8ft oars without outriggers. Both Peter and Richard were quite happy with the appearance from the model - as was I. On double checking the dimensions and found that the bow had crept up too high - almost 500mm above the waterline - it would have caught the wind very badly – so it has been reduced but with a fraction more sheer in the stern. The wireframe drawing reflects the current shape. 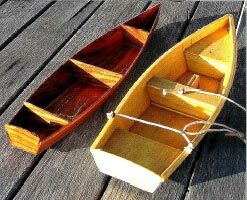 It is interesting to compare the shape of the rowboat with the Goat Island Skiff (GIS - right) which was based around an excellent sailing performance. Both are simple hullshapes, but rowboats have much less power available. Wetted Surface is reduced in the rowboat by narrowing the width of the bottom throughout, particularly in the stern. It was tempting to go toward a canoe stern, but it would sink heavily when a passenger was in the back seat and would reduce stability for other uses. The bottom width is reduced but the width at the gunwale retained to provide a good base for oars. Oar length is approximately twice the beam so if the beam becomes too small then the oars have to shrink too - for less efficiency. Prismatic co-efficient (CP) is a measure of how much volume is in the ends of the boat. Light sailing boats like the sail powered GIS can easily average 6 to 8 knots so need extra volume in the stern and bow at speed. The rowboat will only ever get up to around 3.5 to 4 knots so the CP needs to be lower. It was hard to achieve the exact numbers required because of the transom width so we have gone as far as possible. Getting rid of the passenger and having a canoe stern would make it easier to get the right numbers. I haven't come up with the right name for this boat yet so it remains the MSD Rowing Skiff. 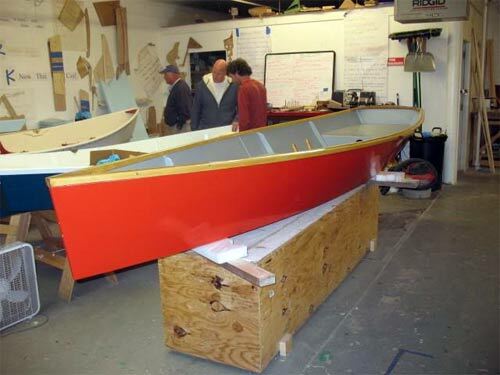 It actually fits nicely within my range – some people build the Goat Island Skiff to serve as a rowboat where it is more than adequate when fitted with a skeg. 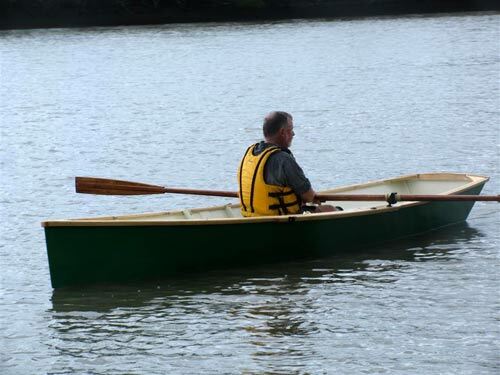 But where less capacity, more speed for the same effort and the ability to cartop (narrower and lighter) is more important the Rowing Skiff will be more suitable. The boat will use up 4 sheets of 6mm ply.